Most people do not go to the shed after dark because they cannot see whats inside. If you had a solar power shed lights in your shed you would be able to find something without a flashlight. Since it is not powered by a sensor, it will not come on when a rodent walks by. Lets look at the Gama Sonic GS 33 K Crown Solar LED Shed Light. Have you ever gone out to the shed at night with a flashlight and tried to find something? This light will let you have both hands free to rummage thru your junk to find what you need. One of the advantages to this fixture is that it does not stay on all of the time, only when the draw string is pulled. Just turn off the light when you leave and it will be ready for the next trip to the shed. You can use this light in other areas. If you need to light the chicken house for extra daylight in the winter so the chickens will still lay, use one of these lights and turn it off each morning for a charge. You will get a 4 inch round Monocrystalline Solar Panel, fixture, rechargeable batteries and instructions with this fixture. The fixture will come in four parts, Solar panel, mount, light fixture and mount. The rechargeable batteries are 3.6 volt and 600 mAh. The light will be good for about four hours on a full charge. There are 6 LED bulbs that will give 6000k or 50 Lumens of light on a full charge. The pull string on and off switch will be easy to find with the small amount of night light from the fixture. Installing your fixture will take drilling a hole in the roof or wall of your shed. You should first locate a spot to mount that will get plenty of sun during the day. Drill a 5/8 inch hole for the mounting post to go through and place a rubber gasket on each side of the roof to seal the opening from the weather. Once the batteries have been installed and the connecting wires from the solar panel to the light fixture, you are in business. There is an off an on switch on the top of the light fixture, don't forget to turn on to make the light work with the pull string. This is not a spot light for the inside of your shed, if you are looking for a light to provide you the ability to just find what you need and get out, this will work for you. If you are looking for a work light for your shed, look at some of the Remote Solar Powered Security Lights I have on other post. Thanks for reading and if you have any comments or questions use the form below. I found your information here very interesting. Not only can this be used in a shed but I can think of some other good places, I myself could use this in my small garage where I have no electricity, it certainly will be beneficial. So just wondering if this could also be used in a woods area to light up a pathway? Maybe if I could figure out the best way to install for my situation? Using this type of light in the woods for a path can be done. Does your location have enough sunlight? 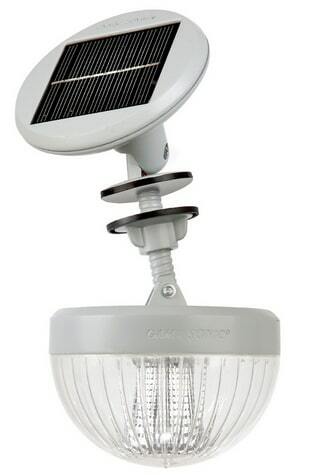 If not you need to get a fixture with a remote solar panel. There are other fixtures that would make a better choice. Because this fixture needs a flat surface that has a hole in it to mount, you will have to fabricate a mount system. It can be done, I would choose another fixture. Love your post, you have a great way of explainining things,a way in which I could even understand 😉 .. I very much like the idea of this garden shed light, I cant even tell you how many times I have gone out at night to the shed and tried finding things, sometime its even worse with the flash light. One comment I did see was that someone used to light the chicken coop so his chickens would lay in the shorter daylight hours of fall and winter. You could use in any area that has a roof and is remote without electricity. This site is wonderful! I love the promotion of this product. The content and review is well written and informative. I like your pros and cons section as well, and I like the honesty regarding the “cons”. Very well written. Thank you! I will probably be coming back to this page in the future when we get my new house built and my husbands shop set so that maybe he can use this in his shop. Thanks for the comment, no use not giving a honest review when you have the information. The reviews have to give a honest information or what are they worth. What other items will you need for the shop? Maybe I can give you some good ideas on what will work best. That’s a bright idea you have right there. Any energy saving techniques, especially that use recyclable energy are always welcome. The world needs such ideas to be able to combat global warming and other climate change menaces. These solar powered shed lights- could 2 or more ‘bulbs’ be connected in series while using only one panel? This solar panel will only charge the batteries for one light. You can set up a lighting system with a large solar panel that will power multiple fixtures. This will take some engineering to get the correct power set up and compatible fixtures. It is easier to just get two or more fixtures with the correct solar panels attached. Hi I love your review on this product. I know its hard for me to look through my shed when its dark. This could come in real handy if i ever need too get something that takes new hands. I have a quick question tho, why would you consider this product over like a head band flash light. The headband flashlight would work, the solar shed light will always be in the shed. If you are out in the yard and wanted something out of the shed, would you want to go in the house or garage and look for a flashlight or just walk to the shed and turn on the light? I’m learning so much while I’m searching for shed options for next spring, since we’re finally going t get or build one. Solar shed lights! I had no idea to even look for such a thing, but what a great idea! I’m adding this to my list; I sure will be busy when spring comes around! These lights will need little or no maintenance after the installation. Just keep the panel clean and change the rechargeable battery when needed. 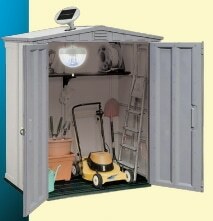 This solar powered shed light seems interesting,i have nevver seen something like this before. For people who like outdoor stuff it can be very useful. But 2 hours is pretty short to me. It seems like a good energy alternative tough. I think it will be better for people who deal with farming. Most people who have a big yard have a shed to put things in. When you go out to the shed close to or after dark, it is hard to find things even with a flash light. This light is not for working, just find what you need and move on. I can also see a farmer using this type of light for their barn or storage bins. I could see someone having one in their outhouse also. That gives me an idea. I am far too scared to go to the shed in the dark – its located right at the end of my garden and has been broken into on more than one occasion. However, we will be getting a new one that is more secure soon and slightly larger than the one we currently have so this post is very handy. Do you recommend any that you can use with a switch? Thanks. This Solar light does have a pull string on/off switch. With a little wiring this could be wired to a wall switch that is close to the entrance to the shed. This would make it very convenient to find your way around your new shed. If this is not what you are looking for, a light with a remote solar cell would be the best. Several of these are available, I have a review on the Maxsa 40218 here. You really make a great point in your opening paragraph. Not only is the shed usually dark, but the pathway to get there is also dark. A light in the shed, a flashlight, and maybe even adding some light to the path would definitely be helpful in my case. Solar power is such a great resource. Itâ€™s amazing that, as humans, most of our existence has been without electricity and modern technology. Now that we have been through an industrial revolution and are doing amazing things in the twenty first century, it seems that we are turning to nature for our energy needs. Quite an interesting development. I found this product on the 1stoplighting site. Itâ€™s a good product and very reasonably priced. Thanks for the comments and looking at my Affiliate program site. Solar energy is the best way to light up your outdoor activities if you get enough sun.